Liquid form links have been collected and carefully matched to make a unique collar necklace. 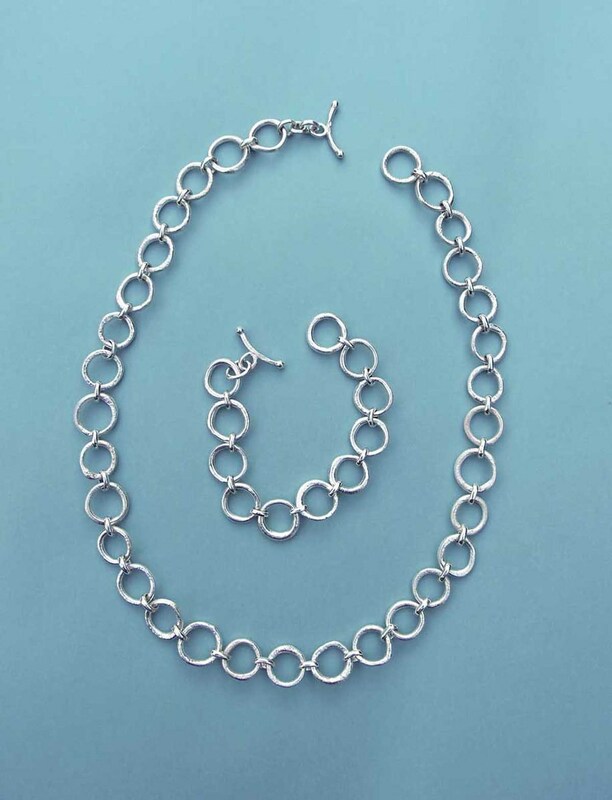 This traditional arrangements of silver links make a contemporary necklace and bracelet. These liquid form rings in silver and in gold are set with cabochon stones. The patterns created by folding and unfolding a piece of silver are always a surprise and a delight. This silver cuff is fun to make and fun to wear. A series of stone print rings, each one is hammered and shaped until it looks and feels perfect. This broad bangle has been shaped with a hammer and textured with the imprint of local whinstones. A broad spiral band ring set with a cabochon garnet in gold. In this collar length 18ct. gold necklace every link is separately made byheating the metal to a liquid state and letting it set in its own natural form. This ensures the necklace has a unique and strong character. These forged silver rings have been inspired by ancient standing stones and aboriginal art works. This forged silver necklace was inspired by the jewellery of an ancient afghhan princess. Clean and confident. A round forged earring with burnished edges.